Black mustard seeds. Photo by Meghan Anderson-Colangelo | SXC. This is Page 2 of a seven-page glossary of mustard types. If you’d like to suggest additional words for inclusion, click here. See all of our delicious food glossaries. Called yellow mustard due to its bright color, and ballpark mustard for its pervasiveness at ballparks, this mustard was first manufactured in America in 1904 by George T. French as “Cream Salad Mustard.” It is made with white mustard seeds mixed with salt, spices and vinegar, with turmeric added to create the bright yellow color. A sweet mustard that contains very little acid, substituting copious amounts of sugar for preservation. A mustard made with Beaujolais wine, lending a deep burgundy color and some flavor of the wine. A recipe that adds flavor by replacing some of the water with beer. 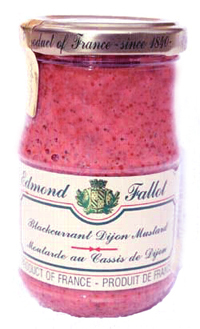 A fruit mustard made by blending black currants into Dijon mustard. This produces a beautiful raspberry-colored, slightly-sweet (although not sugar enhanced) mustard that makes an elegant plate garnish, is used to flavor sauces for duck, rabbit and game, and to make sparkling vinaigrettes. You can purchase Blackcurrant Dijon Mustard online. From the plant Brassica nigra, one of the three of the forty species of mustard plants used to make the mustard condiment. It produces the hottest mustard and is most popular in the Middle East Asia Minor, where it originated. Originally, many mustards were made with the black seed; but it is more difficult to grow than the brown seed, which has replaced it in most preparations. Black mustard seeds are used in Indian cooking, in curries and lentil dishes, or fried and sprinkled over rice and vegetables; when fried they take on a nutty, not hot, flavor. They add color contrast to light dishes like white fish, bread and breadsticks. 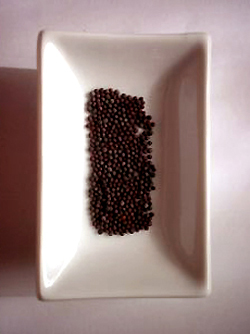 Black mustard seed is more rare at retail than white or brown’ varieties. That’s because the plant grows too high, and the seeds droop too much, to be harvested mechanically. Hand-d-harvesting means a far more expensive product. See also brown mustard (below) and white mustard. Black mustard seeds. Photo by Meghan Anderson-Colangelo | SXC. You can buy black mustard seeds online. A mustard made with Bordeaux grape must, imparting some flavor of the wine. Brown mustard, Brassica juncea, is more pungent than Brassica alba, the yellow or white mustard from which many American or “ball park” type mustards are made. This variety, also known as mustard greens (and by other names as well), has an edible stem and leaf as well. Chinese mustard and Colman’s mustard, among others, are made from brown mustard seeds. 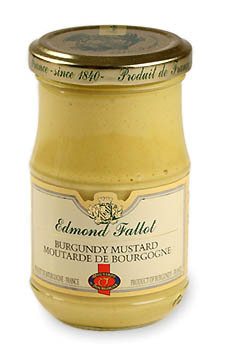 A Dijon mustard flavored with Burgundy wine, creating an aromatic mustard with hints of grape. You can purchase Burgundy Mustard online.